Use these macro to start your data validation troubleshooting. Get a list of all data validation on the active sheet -- the list can be created on a new worksheet, or in a text file. Also, get a list of all sheets, to see a count of data validation cells -- helpful for troubleshooting. To start your data validation troubleshooting, use this first macro to see what is in the active workbook. This macro adds a new sheet in the workbook, and lists all the sheets, with a summary of the information on those sheets, including the count of data validation cells. This is helpful when troubleshooting a workbook -- sometimes entire columns have data validation added, and that can cause Excel to slow down, or to crash. If you see a high number of data validation cells listed, you'll know where to focus your troubleshooting. You'll also see which sheets have NO data validation, so you can ignore those for now. NOTE: There is a Sheet Info command in my Excel Tools add-in, and it creates a list of sheets with several columns of details. Here's the code for the macro – store it in a regular code module in your workbook. There are instructions on the Copy Code to a Workbook page. 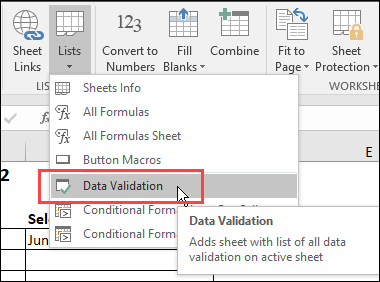 After you run the sheet summary macro, you'll know which sheets have data validation rules, and how many cells have those rules. You can go to those sheets to dig in deeper, based on the data validation cell counts. There are also troubleshooting suggestions on the Data Validation Tips and Troubleshooting page. An extremely high count usually means that data validation rules have been applied to entire columns, instead of a small range of cells. If entire columns are selected, remove the data validation rules from all of the rows that aren't being used. 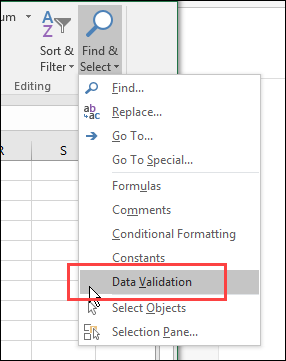 If the selected cells have more than one type of data validation, a message will appear - "The selection contains more than one type of validation. Erase current settings and continue?" To confirm that all the unnecessary data validation has been cleared, use the Find & Select Data Validation command again. If the data validation count was in the range that you expected, go to those sheets, and use the macros below, to list all the data validation rules on the active sheet. There are two versions of the macro. They show the same details, but one puts the list on a new sheet in the active workbook, and one creates a text file with the results. WARNING: If the data validation cell count is in the millions, DO NOT run the rule list macros. Excel will hang before it gets very far in the macro code. Delete the unnecessary data validation first. After running the macros, if you don't spot any obvious problems in the lists of rules, there are more troubleshooting suggestions on the Data Validation Tips and Troubleshooting page. 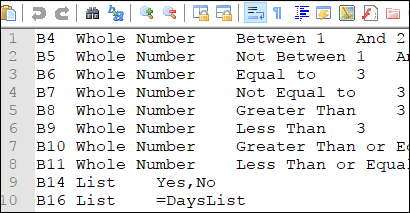 The following macro creates a text file with a list of the active worksheet's data validation. In the screen shot below, the data validation locations and rules are listed in a text file. At the end of the macro, it opens the folder where the text file was saved. WARNING: If the data validation cell count is in the millions, DO NOT run the following macro. Excel will hang before it gets very far in the macro code. Thanks to J.E. McGimpsey for generously sharing his code. strPath = Application.DefaultFilePath & "\"
'strPath = ThisWorkbook.Path & "\"
The following procedure creates a new worksheet in the active Excel file, with a list of the active worksheet's data validation rules and location. If you have a copy of my Excel Tools add-in, it has a command to create a list of all the data validation on the active sheet. 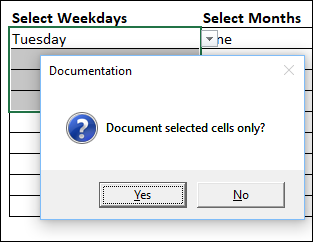 After you click the Data Validation command, a message appears, asking if you want to list the rules for the selected cells only. If you click No, the list will show the rules for the entire active worksheet. The Excel Tools add-in also has commands to create lists of sheet contents, such as the summary list shown below. 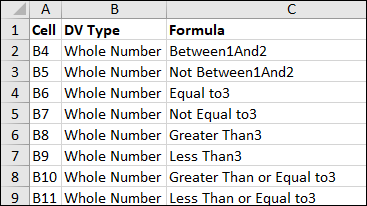 This list shows the data validation cell counts, as well as formula counts, used range address, tab colour, and other details. Download the sample Data Validation Documenter file. The zipped file is in xlsm format, and contains macros. When you open the workbook, be sure to enable macros, if you want to test the Data Validation Documentation macros.